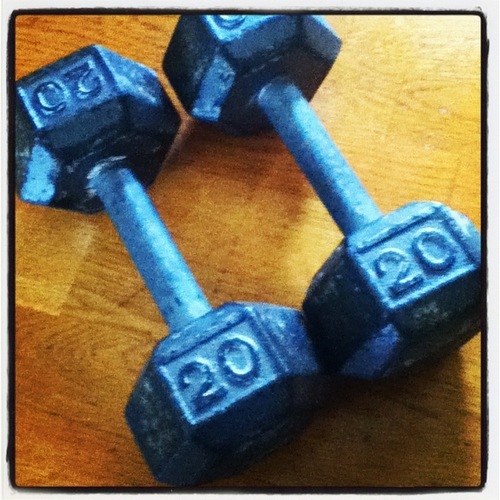 My 20 lb weights – I’m excited I can chest press these now! I told you all that I recently joined the gym but I forgot to mention that I’m spending most of my time in the weights area. I try to go as early as possible before it fills up with big, beefy, intimidating guys! Well, I’m trying something new. A few years ago I was introduced to the idea of lifting heavy weights when doing P90X. I was surprised at how strong and confident this made me feel. I liked it. Fast forward a couple more years and I got hooked on Chalean Extreme. Another at home workout DVD that focuses on lifting heavy weights. Both of these workout still had a decent amount of cardio thrown in. Now, for the first time, I am following a plan that is made up of at least 80% strength training and only about 20% cardio. But I like it, too. Although I will say that right now I feel a little bulky. But I do believe this is because I am only 7 weeks in. I will be adding a little more cardio over the next 4 weeks and expect to lean out. At least I hope I do! I plan to do short HIIT training sessions. I have found that if you really want to change your body, you need to do some serious strength training. It is one of the things that can truly change your shape. Plus, as you build muscle, your metabolism will increase. Which will in turn mean weight loss or the ability to eat more yummy food if you don’t need to lose weight. I know some people shy away from lifting heavy weights because they fear bulking up. But this is very difficult for most women to do. Yes, I did say that I feel a little bulky right now, but that is mostly because I am in the beginning phase. I’m not looking overly muscular or man like, if that’s what you are thinking! 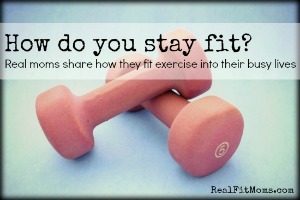 I’d love to know, do you include strength training in your workout routine? If so, do you lift heavy? I love that you’re doing strength training! It’s so important to challenge your muscles – and it’s even great for your bones (making it ideal for older men and women). I typically use light weights with high reps.